Since the last ALUMNI WATCH, the Portland Trail Blazer have played three games: Thursday night at home against the Denver Nuggets, Saturday night at home against the Minnesota Timberwolves, and they visited the Golden State Warriors Sunday night; the Blazers won the first two games and lost last night against the Warriors. +19 in one game, 20 minutes in another, HERE WE GO!!! CJ has now played 10 games in his young career. His averages through ten games: 14:17 minutes, 6.0 PPG (43.6 FG%, 36.4 3Pt%, 66.7 FT%), 1.3 RPG, 0.6 APG, 0.4 TOPG. 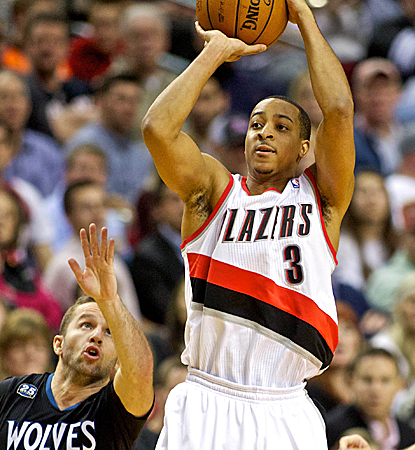 The Blazers return home tomorrow night to host the Memphis Grizzlies. CJ will most likely be guarding Courtney Lee. Lee has played nine games for Memphis since coming over from the Celtics and has been playing more than he did in Boston. He is averaging 30 Minutes, 15.3 Pts, 2.7 Reb, and 14 Ast in those nine games.